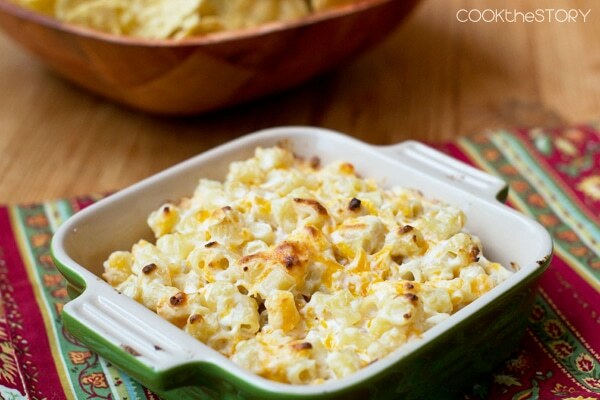 This Macaroni and Cheese Dip is the ultimate comfort food. Perfect for Game Day or any time you’re craving carbs and cheese. As we roll into January I start thinking about the Big Game Days ahead. Not because of the games but because of all the new Game Day food ideas I’m going to be drooling over. I’m looking forward to eating them all! 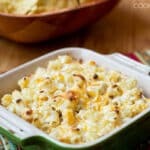 This year I’ve come up with a really delicious game day food: Macaroni and Cheese DIP! Does mac ‘n’ cheese dip sound weird to you? When I first thought of it, it seemed weird to me too. But then I did a quick test. I pulsed some leftover macaroni and cheese in the food processor. Then I added more cheese and a bit of milk to make it creamier. I baked it until it was gooey and the cheese was browned. I scooped some onto a slice of baguette and ate it. And scooped and ate and scooped and ate. Bread. Noodles. Gooey Melted Cheese. I couldn’t stop. It was the ultimate comfort food. I immediately started testing the recipe in various ways to get it perfect. The version I’m sharing today is the best by far because it’s really tasty and super-easy to make. 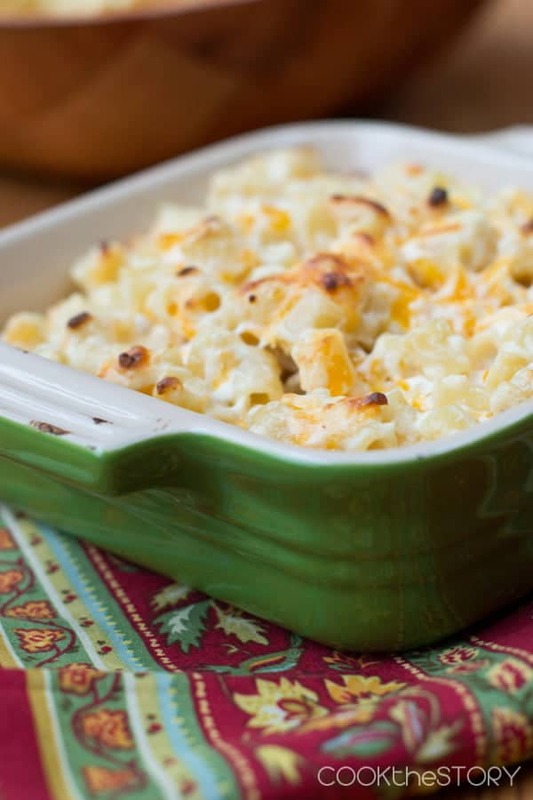 It’s pretty similar to the original but instead of leftover macaroni and cheese you cook up some macaroni noodles and then put them with some cream cheese and sharp cheddar in the food processor. Then you bake that up and dip in. If you make this on Game Day you’re going to be the MVP. No doubt about it! Oh! 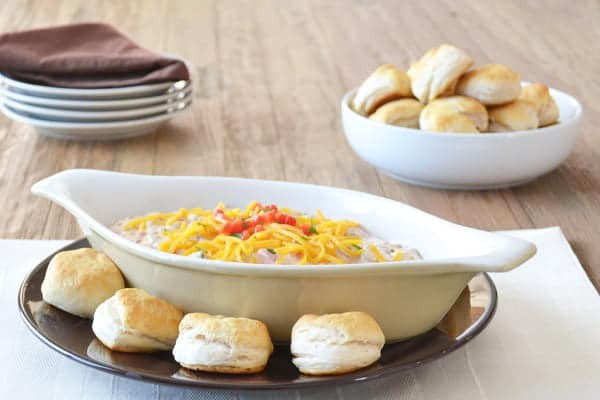 Another dip that everyone will thank you for: This Double Down South Dip. It combines the flavors of two of my favorite Southern dishes: Sausage Gravy and Pimento Cheese. Sausage, creamy cheese and roasted peppers. So good. Even better if you serve it with mini buttermilk biscuits as dippers! Put all ingredients in a food processor and pulse a few times. You want it mostly pureed but with some bits of noodle remaining intact. If the mixture seems dry, add more water. Transfer to a small casserole dish. Bake until heated through and browning a bit on top, 10-15 minutes. The only thing better than bread or cheese is putting them together – and this dip takes it over the top! Such a creative recipe!! I’m am sure you’re aware that everyone on earth (who digs cheese) wants to face plant into this and go Pac Man on it, right? Right? lol. Angela, that totally just cracked me up! Thanks!! 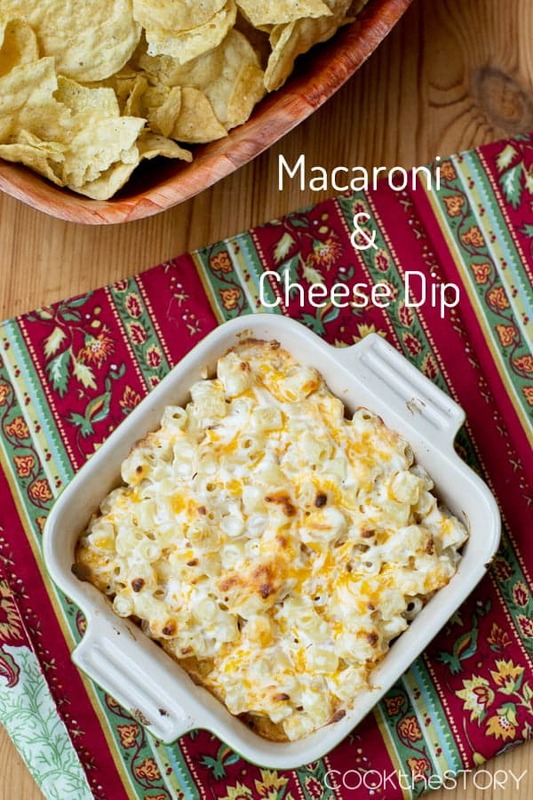 Mac and cheese in dip form?! Genius! You do realize that I want to do a nose dive into this dip, right? You’re SO flippin’ genius! Wow, fabulous idea! Who doesn’t like mac’n cheese? Yum!